Loyal Poker Copilot customer Randy informed me that PokerStars is now automatically saving tournament summaries. Thank goodness! This makes one of the most common Poker Copilot improvement requests possible. 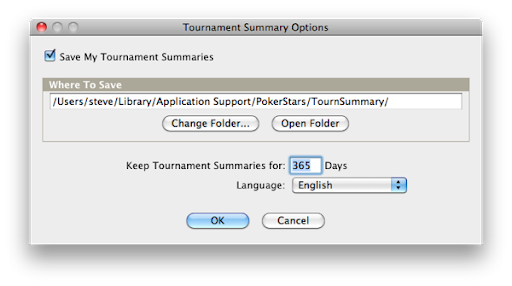 In PokerStars, from the Menu select “Options” -> “Tournament Summary Options…”. Unfortunately Poker Copilot needs a small alteration to be able to read these files. That’s because – at least on my computer – the tournament summaries have a strange hidden character (ASCII #16) at the beginning of the first line. The next Poker Copilot update will work with these files.